My Thoughts: We are introduced to Cassia who is turning 17. She lives in a closed knit society that they never leave until they are older and thats only if they are chosen to be matched with someone outside which is almost always. They than begin their new lives. At the age of 17, all society members get to see who their matches are. The person they are to spend their life with, reproduce, etc. Cassia picks out a beautiful green dress for the matching. Her mother and father attend along with the other girls/guys families who are turning 17. This is basically a dystopian novel which I do not usually enjoy. Cassia gets matched and guess who comes up on her screen. Xander, her lifelong best friend. How cool is it that she already knows him and all those first time's shes nervous about has already happened. She doesn't have to go through the first meeting, first date, first chat, etc. She's on cloud nine. Later, she inserts her micro-card to see what they thought she know about Xander and another faces pops up first. It's Ky. Another guy in her community. She actually knows him! So, of course she starts to question things about all havoc breaks lose. Ky and Xander were both great guys. I had a hard time choosing between them. On one hand you have best friend Xander, handsome and always there for Cassia, but than there is Ky, whose a hard worker, and a mysterious guy. I could definitely feel for Cassia. Things were just not easy for her. Cassia was a very strong character. She wanted to follow the rules but she didn't always agree with them. She just wanted what was best for everyone. She cared deeply for her family and friends. And she had feelings for both Ky and Xander. I could really relate to her feelings for both! I really did enjoy this book but the ending was so abrupt that I wanted the next book already! Overall: Really loved it a lot. Totally different than what I expected. Cover: Come on, that cover is really plain but magnificent! I love how she is in a bubble and her dress is green! Such a beautiful cover. I enjoyed reading your review. I bought the book last week and can't wait to start it. Glad you enjoyed it. This sounds wonderful and I agree, that cover is gorgeous. Great review! I have heard such great things about this book and I want it so badly! :/ Haven't had the money to go get it from Borders yet! Thanks for the review though, I really liked your thoughts on it. And I agree, the cover is simple but gorgeous! 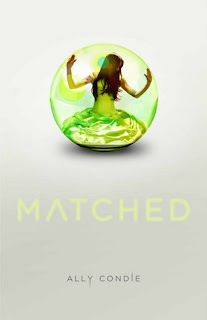 Its cool that its actually her green dress, I just thought it was a cover picked color. Thanks for your review - I'm really looking forward to this book.